A youngster cycles down Pequot Avenue on Wednesday during the annual Bicycle Parade and Picnic sponosred for Independence Day by the Pequot Library. Alison Suri traveled from Brooklyn, N.Y., to Southport on Wednesday with her son, Jameson, to attend the Pequot Library's annual 4th of July Bike Parade. "It's wonderful," Suri said as dozens of kids competed in sack races on the library's Great Lawn after riding bikes decorated in the colors of Old Glory from Southport Center to the library. "You certainly don't find opportunities like this in the city. My son is 3½. He gets to come ride bikes and run around with the kids and just experience the suburbs and experience the holiday as well." Suri said her sister, Lauren Pinto, recently moved to Fairfield's Southport neighborhood and told her, "There was a great parade and party happening that we should come visit for." 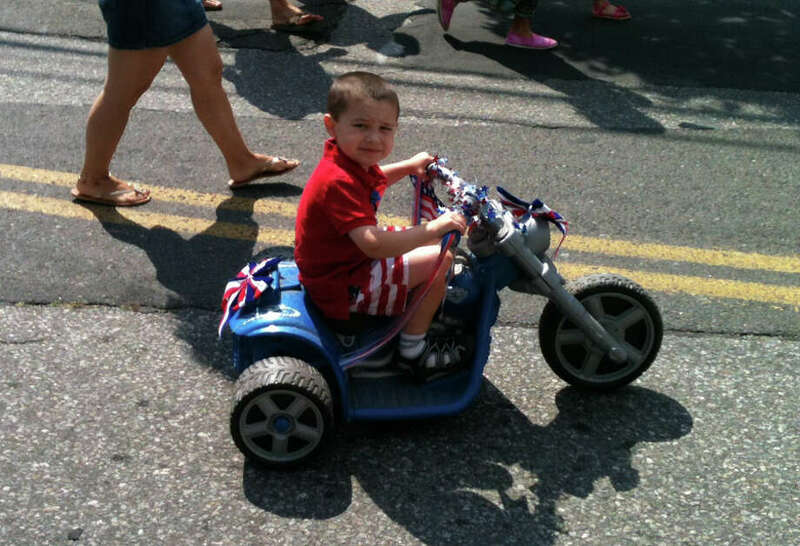 Brenda Giandurco, who came to the Independence Day festivities with her husband, Vincent, and their daughters, Grace, 8, and Ava, 6, said the annual bike parade was "very inspiring." "We've been the last few years and it's a really fun event for the whole family, and the kids love the bike parade," Brenda said. "It's like old-fashioned America; very patriotic too." She said she most liked the bike parade "because you really feel the spirit of the community." At 10 a.m., more than 100 kids rode bicycles, decorated in red, white and blue ribbons and streamers, from the "Five Corners" intersection in Southport Village to the 720 Pequot Ave. library a few blocks away. The kids then enjoyed sack races, a Revolutionary relay race, hula-hoop contest, American Revolution trivia contest, face painting, arts and crafts and hot dogs and ice cream, all on the Pequot Library's Great Lawn, over the next two hours. "It's a great early beginning to the holiday," said Susan Ei, the children's librarian who served as informal emcee for lawn games. "People come out in the community together and share some old pastimes. The kids look forward to it every year." Belle, the library's popular mascot bunny, led the bike parade, Ei said, adding that the 4th of July was the only day all year that Belle has to "work." Rachael Previti, 11, who rode her bike to the library alongside her best friend, Brooke Powning, 11, said Wednesday was her first time at the annual parade and that she most liked the hula-hoop contest and seeing her friends. "I didn't want to go but I'm glad I did," she said. Brooke said she liked the variety of activities, from face painting for little kids to contests for older kids. "Everybody has something to do. I came here a few other times when I was littler," she said. The 4th of July Bike Parade has become an annual tradition for the McKinnis family, said Beth McKinnis, who was at the parade with her husband, David, and their children, Sarah, 11, Andrew and Alex who are 8-year-old twins, and Matthew, 5. "The kids love the bike parade and we enjoy the small-town feel of it," Beth said. Sarah McKinnis added, "You get to put cool stuff on your bikes." Ei said the event, which follows the mid-June street parade and Blessing of the Fleet in Southport, started about 15 years ago and gradually grew in activities every year, though the library abandoned a pie-eating contest about a decade ago. Gean Tremaine, who helped organize the event this year, said it gives parents and kids something to do in the morning on the 4th of July. He, like many other attendees, cited the bike parade as his favorite part of the event. "I think the bike parade is just so classic and iconic to a small, village-type atmosphere for the 4th of July," he said. Face painting is always popular, Tremaine said, and his niece, Isabelle, 5, enjoyed the shell princess design that Patty Little of Milford painted on her face. "It was pretty, and I want to be like Ariel," Isabelle said, referring to a movie character. Ei said about 15 teenagers and pre-teens helped to set up the event, manage the arts and crafts stations, hand out and grade the trivia quiz, and run the games.